There’s nothing like biting into a warm, freshly baked blueberry muffin. Our recipe for Blueberry Maple Muffins tastes and smells incredible because maple syrup and blueberries are naturally a perfect pair. We’ve adjusted the usual blueberry muffin recipe in favor of healthier ingredients like all natural maple syrup in place of processed white sugar. Cold-pressed coconut oil replaces refined oils like corn oil, vegetable oil, or worse yet margarine. The result is a muffin recipe that produces moist, fluffy muffins. 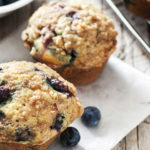 Watch 21 Day Fix creator Autumn Calabrese and her brother, chef Bobby Calabrese make a similar version of this recipe for Blueberry Maple Muffins on their healthy cooking show, FIXATE. These healthier blueberry muffins taste — and smell — incredible. Prepare 15 muffin cups by lining with muffin papers or coating with spray. Combine flours, wheat germ, baking powder, baking soda, salt, and cinnamon in a medium bowl; mix well. Set aside. Combine eggs and maple syrup in a medium bowl; whisk to blend. Add buttermilk, oil, and extract; whisk to blend. Divide batter among 15 prepared muffin cups. Bake 13 to 14 minutes, or until golden brown and tester inserted into the center comes out clean.